It's not often that my regular grocery store gets new candy products (which makes me think I should find a new regular store), but recently, they started carrying Trident Vitality gum. When I brought Vigorate home, my husband thought it was a pack of cough drops. 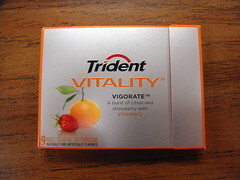 Trident Vitality seems a bit like the Vitamin Water of the gum world. 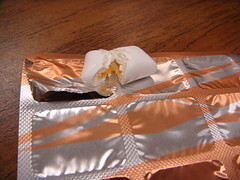 Was anyone really crying out for vitamin C in their gum? Still, even if I'm not using it as a health supplement, I did buy the gum, so the marketing strategy must be working. The liquid center reminded me of the gel in Gushers fruit snacks. Right away, the citrus (mainly orange) flavor was very strong. Although the box also lists strawberry as a flavor, it was only hinted at. There was also a bold cooling effect, so strong that my throat burned a bit every time I had a piece. In fact, they were very much like orange cough drops. The gum chewed very soft, and the flavor tapered off after about 5 minutes to a mild, sweet, and slightly tart fruit. The cooling rush hung around for much longer, and it reminded me a little too much of medicine to make me want to buy this flavor of Trident Vitality again. Wow, havent seen this gum before. Your post made me question whether medicinal gum is a thing. Cough drops are just slowly dissolving minor medicines right. Why not cough gum? Same idea, I think. I hope there's not such a thing because I think we just invented it!